The metaphysical properties of stones within the alphabetical section from Sa to Sm is what the theme of this article is about. In-depth details and use of some of the crystals and stones listed here may also be found in various other parts of this web-site. 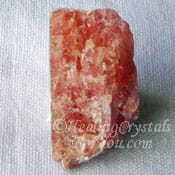 A number of the crystals in this category have their own page, where information about them is covered in more detail. Check out the picture grid below. 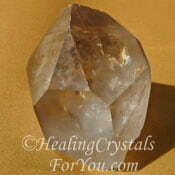 Under each picture you will see the name of the crystal shown, and if its name is highlighted with a link you can click on the link to take you to another page about it. To allow you to find the information more easily I have compiled the photo grid below as a summary or list related to this particular section of the alphabetical list of healing stones. For any of the pictures that do not have a link below them, you will find a short summary of the metaphysical properties of stones like them below. Once they have their own in-depth page they are no longer discussed here. 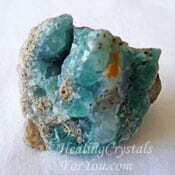 There are many in-depth articles on this site about specific healing crystals for you to learn about. 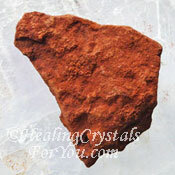 Individual pages for specific stones provide information such as healing attributes and ways to use individual healing crystals and you can read them by using the link to go to their page. So just remember, throughout this site, if there is more detailed information provided on the meaning of a specific crystal it's name will be highlighted with a link, and the picture is also a link in that case. There are also links you can click on throughout the text. These may be related to an aspect of how crystals may help you, such as developing psychic abilities or other attributes, as well as in-depth information about crystals generally. Please Note: As this page was very long, the properties for the stones in the second half of the S Section have been given their own page. So if you are here looking for a stone starting with S that is in the section of the alphabet Sn to Su, these stones can now be found on another page here. 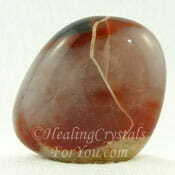 Sacred Light Stone is a type of stone that very few people know much about. They are found in the Rub al Khali desert, which is a rather large and remote desert, 250,000 miles wide. It is peopled by only sparse Bedouin tribes. 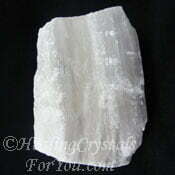 They are found alongside stones known as Boli Stones, which are high vibration Calcite Crystals. The metaphysical properties of stones like the Boli Stones and Sacred Light stones are not the same, but both have a high vibration and they may be used together in meditation. 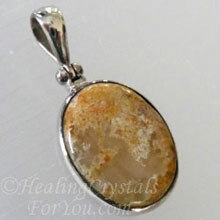 They are said to work well used with Prophecy stones, and they have a strong feminine energy. They help you to have a deeper appreciation of life, and may aid you to shift your consciousness. Sagenite is a stone that is made up of a mixture of Rutile in quartz and/or in agate, and often also contains other minerals such as actinolite, chlorite, goethite or manganese. 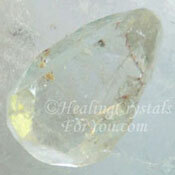 The inclusions can occur in a fan shape or simply floating loosely in the matrix stone. 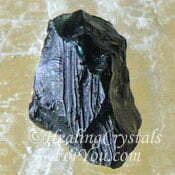 The metaphysical properties of stones like these therefore varies depending on the minerals embodied in it. They are commonly known for their action to assist you to learn life lessons, and to not have to repeat a lesson over to learn it. 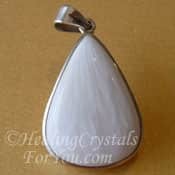 These stone are said to be useful to use when sageing for clearing negative energy, as they can strengthen the action being carried out, and boost the level of the resulting white light. 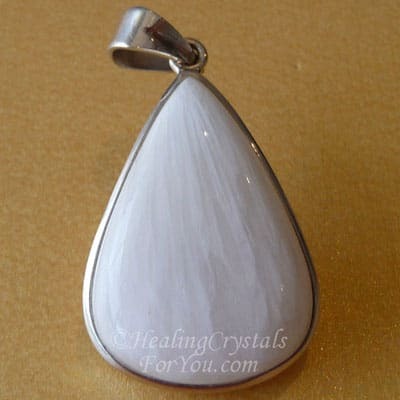 This stone has a lovely energy that encourages kindness, and to look at situations in life in a positive way, and it is also said to be protective of pregnant women and unborn children. Sapphirine is the blue part of the specimen shown.This is an interesting stone, and metaphysical properties of stones like these are known to have mixed effects in different individuals. 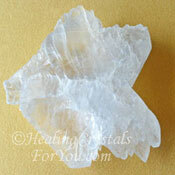 Many people's experience of this crystal is that it creates a soothing and quite deeply calming action. 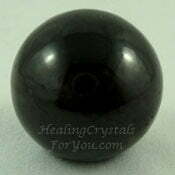 Used in meditation it may help you to slip into a deep and tranquil state, and it is helpful if you do journey work to assist you to return safely. It is also known to be a cleansing crystal, that helps you to release issues that need to be let go of, including past life issues. This may allow you to improve your life and to get you onto the right path. There are other effects reported, and some people find that it opens up deeper areas of their being, where they experience old and challenging issues that come up to be dealt with, commonly known as "dark night of the soul". Satyaloka Quartz is a variety of quartz from a specific area of India, from a small monastery in the Satya Loka mountains. In the past the stone was gathered personally by the monks from the monastery. It may now be less common as the availability of it did dry up for awhile. 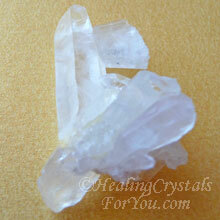 The metaphysical properties of stones like these unique quartz crystals is very powerful. Their special energy is the vibration of enlightenment. The monks believe that the mountains are the reason for the stones specific vibration, which is high and pure. Its purpose is to shift your vibration to a higher state while still on earth. Even small pieces have a lovely high vibration energy. 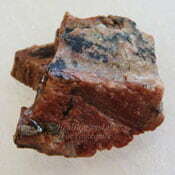 While this is said to be a rare crystal, I have now been able to obtain quite a few pieces of this stone. 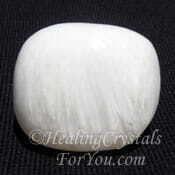 It is a high crystal energy stone and if used with others of this group is highly beneficial. You can now also get a stone with a similar name, sold by a large crystal retailer. I am not sure if the stone is quite the same vibration as the original stones, or whether its just another case of a rename of the original stone. 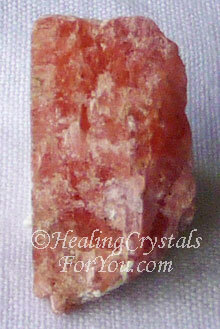 Scapolite is a stone of purpose, helping you to set your mind to a goal and then reaching it. It aids self-discipline and will-power. 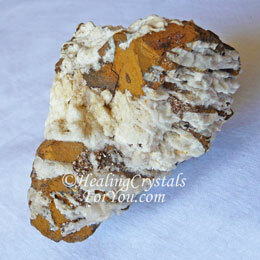 Yellow Scapolite aids the attainment of prosperity through the solar plexus chakra, and Blue Scapolite works within the throat chakra and third eye and aids psychic powers. 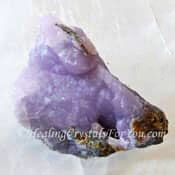 Both purple and white Scapolite work within the crown chakra, the soul star chakra and the higher etheric chakras, and aid psychic knowing and communication with your spirit guides. Pink Scapolite has specific aspects within the thymus and heart chakra, and is a stone for aiding forgiveness and bringing through compassion. 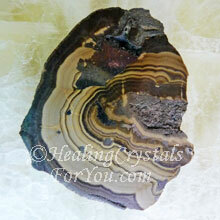 Schalenblende stone forms in layers of different minerals. It is made up of a mixture of Galena, Sphalerite and Marcasite, so as Galena is a lead ore, take care when handling these stones. The metaphysical properties of stones like these are quite unusual in that they effect the area where they are located, bringing the energy of strong protection against negativity. 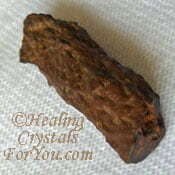 They were used in the past by Shamans in ancient Celtic rituals, and were seen as a highly sacred even magical stone. They have a good earth energy that helps with grounding and bring the energy of peace and harmony between disparate people. They also assist communication between those who may have nothing in common, and they will help you to make contact with people who you wish to meet. 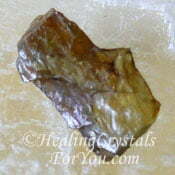 Scheelite is an excellent crystal to help you to be on time, as it stimulates punctuality. If you or the person who you are buying it for, is inclined towards a feeling of being superior to others, this is a stone that may help you be less high-handed and dictatorial. Known to balance male-female energies, balances excessive male attributes. These crystals come in a range of colors, and the metaphysical properties of stones of each color may be slightly different. But all of these crystals will help you to align all of your chakras. They may aid you to better understand the specific need of an individual chakra as it pertains to you personally, and help you to understand when a chakra is out of balance. 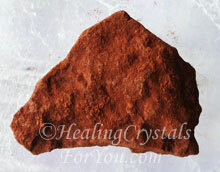 Sedona Stone is also known as Sedonalite, and is interesting because it is known that the metaphysical properties of stones from the various Sedona vortexes have different energies. 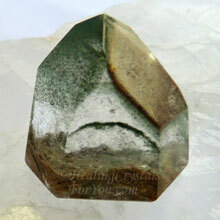 I was extremely fortunate to obtain a piece of this stone from each vortex, and this one is from the airport vortex. It is interesting feeling the differences between the stones from the different areas. 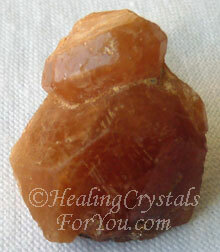 The healing properties of stones from any of the Sedona vortexes are quite potent. 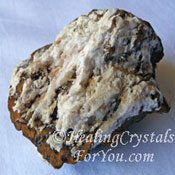 Stones from any of the vortexes have a strong energy that is both healing and can be used to boost psychic gifts. 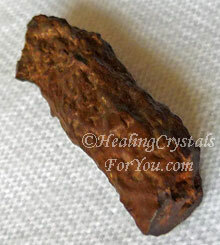 As a healing stone they are excellent to rejuvenate and revitalize you, both on the physical and spiritual level. They are strong stones to assist you to make a connection with the Sedona region. Use it in meditation, when you can respectfully make a connection with the ancient spirits of the area and the energy of the land. Serandite is a helpful stone if you have difficulties in your relationships, or if you feel dissatisfied and envious of others. 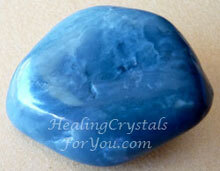 The metaphysical properties of stones like these are quite powerful to help you to let go of jealousy or distrust. 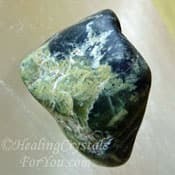 This stone's energy may help you to reconcile to situations that make you feel frustrated about the circumstances of your life, as well as helping you to let go of self pity, depression, sadness and the desire to take revenge on others. This crystals vibration may help you to attract the appreciation of others, and aid you to feel more self confident, and assured regarding your abilities. Use it if you need help to attain success in what you are doing, as its energy can help you to work out exactly what you want in life, thus enabling you to set realistic and worthwhile goals. 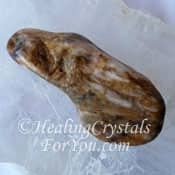 For anyone working in sales or as any sort of health practitioner, this stone is known to attract customers to you, in some quite unusual and interesting ways. Also helpful to remove negative entities from your environment. 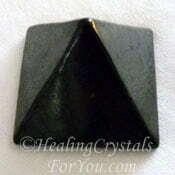 Serendibite is said to be very rare, but that being the case, the black stones are perhaps less rare than the other colors, although all can be hard to obtain. This is a very small specimen and while it may look big in the image, the picture has been enlarged so you can see what it looks like. The metaphysical properties of stones like these relates to their soothing action, as they help you to feel calmer and more peaceful. 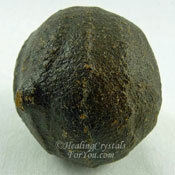 Excellent to use in meditation as they will stimulate the third eye, and help you to experience clear psychic visions. They are also helpful to bring synchronistic events into your life, so when using them keep an eye open for meaningful coincidences. It will help you to find out information at certain locations, almost by accident. As they also stimulate your intuition, you may find this combination to be very helpful to lead you to beneficial occurrences. Shamanic Dream Quartz is also known as Shaman Quartz or Chlorite Shaman Quartz, as it contains large amounts of chlorite as inclusions in clear quartz. You may not be aware of the fact that chlorite can be green and/or red, and many pieces of Shamanic Dream Quartz contain both red and green chlorite, like this one. 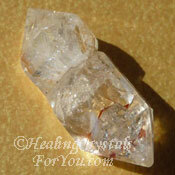 These quartz crystals are potent stones to use for deep meditation, and to boost your innate visionary gifts. If you immerse yourself in its energy it may assist you when doing inner journeying. The metaphysical properties of stones like these may vary according to the actual included minerals. 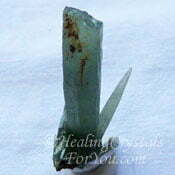 Depending on the individual crystal, they may contain chlorite as well as Rutile and Hematite, which will affect how they benefit you. Siberian Blue Jade is a name used to describe an amphibole rich stone which is said to be a type of blue Nephrite or Blue Jadeite. These blue crystals are also known as Dianite, and were named after Princess Diana when they were discovered in 1997 (the year Diana died) in the same area in Russia where Charoite comes from. They are known as jade even though they are a type of Nephrite, but whatever their name the metaphysical properties of stones like these are valuable. They will help you to let go of anger and may assist those who have ADD, as well as helping arthritis and asthma sufferers. They will help you to widen how you look at the world and are good to use for meditation. 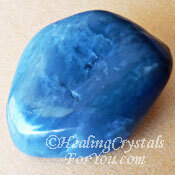 These blue crystals have a lovely energy to aid anxiety and stress and may aid the development of psychic abilities. 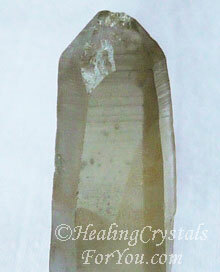 Sichuan Quartz is a high vibration quartz that is found in the Himalayan Mountains in the Sichuan province of China. 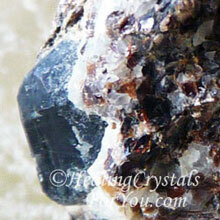 These quartz crystals often have inclusions of organic material within them, and many embody dark carbon pieces. They are known to be powerful stones, that often work quickly to unite the third eye and crown chakras. The metaphysical properties of stone like these are impressive, as they will connect you to the higher realms. This connection can open up new psychic gifts, including stimulating the birth of psychic visions or clairvoyant abilities. These are high vibration stones with an action that may assist you to have past life visions, particularly of lives where you lived in Buddhist lands, including ancient China and Tibet. 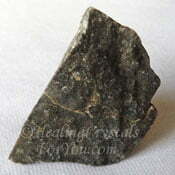 Siderite is a stone that is helpful to align all the chakras and meridians. 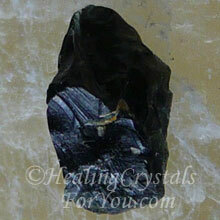 This action happens automatically, simply by having this stone present in your auric field. So it is useful to carry a piece in your pocket. This is also a good stone to use if you are bed ridden, and in particular if those caring or you do not share the same beliefs. It may give you the courage to assert yourself in these conditions, especially if others are trying to run your life. 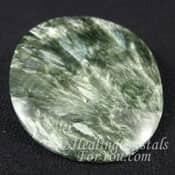 The metaphysical properties of stones like these also relate to the way they can help to bolster your dedication to your work, and to assist you to continue working in your favored area of expertise. 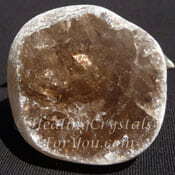 The metaphysical properties of stones like these relate to their action to provide protection to those that carry them. Having them on you may benefit you when you are traveling, and this also applies to traveling in a spiritual sense, within the astral realm. 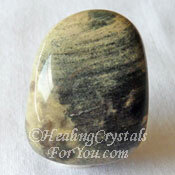 Like many other types of jasper it will aid healing, and it may help you to feel more contented within your life, as it helps you to feel nurtured. 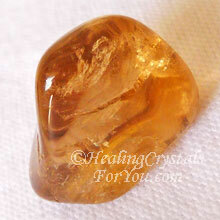 It resonates within the solar plexus chakra to boost willpower and help personal power. Sinhalite has a loving heart based energy, that can easily be felt as it resonates quite strongly. 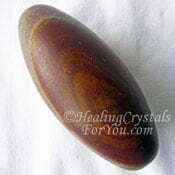 This is a stone that helps you to let go of feelings of loneliness, and to feel at ease when you are on your own. These stones radiate natural golden light, that stimulates the solar plexus area to help to increase your self esteem and personal power. 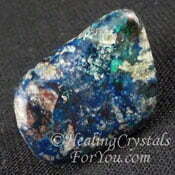 The metaphysical properties of stones like these also pertains to its action to boost your creativity. It helps to boost innovative thinking and aids you to find interesting solutions to difficult to solve problems. 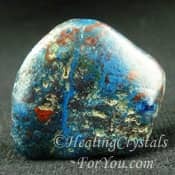 It is also a stone that resonates with the energy of truth, and it is helpful on your life path as it disposes you to walk your path with love, light and a kind attitude to others. 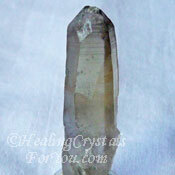 Smokey Lemon Quartz is also known as Citrine Smoky Quartz or Lemon Smoky Quartz. These crystals commonly show a mixture of colors within the stone. They may be darker in parts, like Smokey Quartz, and have the yellowish Citrine Crystal color as well as sometimes showing a yellow phantom within darker crystals. The metaphysical properties of stones like these are quite powerful, and they are well recognized as excellent crystals for healers to use. They are said to heal on all levels, and to help the healing of issues that you may have had for a long time, that have been difficult to shift. They are also known to relieve depression and anxiety. Sometimes you can have issues from past lives that cause problems such as negative beliefs and deep felt fear, and they can be related to vows taken in past lives. 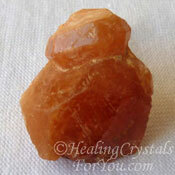 This crystal helps you to clear, or let go of these vows, including vows of poverty, as the Citrine energy in this crystal assists this. 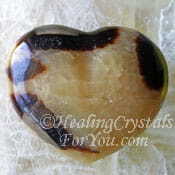 They are excellent to aid grounding, and can create a good connection between the solar plexus and earth chakra. Melody's Encyclopedia, Love Is In The Earth is a book that covers more than most. This book gives you so much information, and covers so many crystals that on its own is almost a reference library. 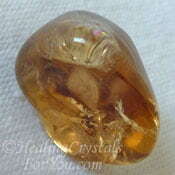 For more information on which chakras these stones will assist, see the following list. 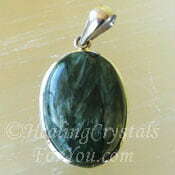 It gives more detail on the specific chakras that each stone may particularly benefit. It is possible that the metaphysical properties of stones that are powerful healing crystals may be able to be used in a variety of areas. Many stones are able to be of benefit in more than one part of the body. When this is the case a chakra stone may be in more than one chakra category within this list. If you would like to learn more about what chakras are, please go to the page covering all of the meanings of the individual chakras, for a more detailed overview. 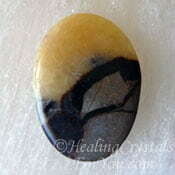 Please see the chakra stones page, to read a more general overview of chakra stones. 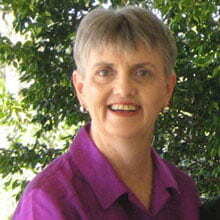 Are you are interested in the metaphysical properties of stones or crystals in another part of the alphabet? If you are looking for more information about a stone on this page, check out if there is more in other places, by using the sitemap, link below.